What's Behind an Electric Meter? The incoming overhead feeder wires connect to the top (line connection) two hot connection points via terminal lug connections. In a typical 100-amp service connection, these wires will likely be #2 THHN. The center post is for connecting the incoming neutral/ground connection from the utility company feed. The outgoing connection points are the load connection points. This is the portion of the meter that feeds the service panel or the electrical disconnect. As with the line connection, the load connection has the two hot feeds and the center is the neutral connection. There is also a #6 ground wire that connects to the neutral/ground connection on the meter and also connects to the ground rod. How Does an Electric Meter Read Power? Have you ever wondered how the utility company knows how much power you used each month? The utility company often connects its power lines to the weather head on your electrical power pole. It is connected to a pipe that connects to your electric meter. This the device that will measure the power your electrical system uses throughout the month. The electric meter not only measures power but is also one way the utility company can disconnect power from your home. The electric meter is a clear, glass-encased metering device, almost like an over-sized mason jar. Since it is clear glass, you can see through it. Inside, the glass houses the measuring devices that include dials and wheels on the older model meters. Usually, there are five dials that measure kilowatts and a large rotating wheel that sits below them. These type meters must be read by the owner of the property or the utility company will read it for you, sometimes for a charge. The newer electric meters are digital and have an added feature to them. These devices are actually read from the utility companies office. A signal is sent down the line from the electric meter to the utility company that identifies your particular meter. 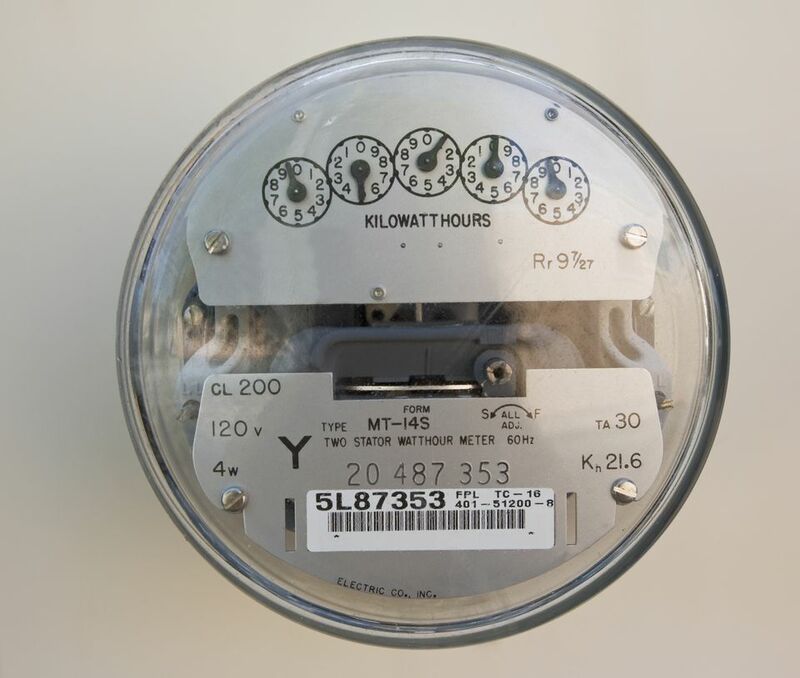 Electric meters read kilowatt hours. To simply that, 1-kilowatt-hour = 1,000-watt-hours. To simply that even further, if you turn on a 100-watt light bulb for ten hours, you'll consume 1 kilowatt of power. 100 watts x 10 hours = 1,000 watt-hours or 1 kilowatt, since kilo = a thousand. Each month you read the dial, there are five places to record your readings. To read the electric meter dial, start with the number digit on the left and read towards the right. The utility company brings wires overhead to connect to the meter on the outside, where the hot wires will connect. If you look, it is where the meter will also connect. The connection terminal in the center is where the neutral will connect. Strip the wires and insert them into the terminal. Tighten the screws and tug on the wires to ensure that the connection is tight. The load side of an electric meter can be wired to the electrical disconnect or electrical panel. To do this, connect the two hot wires on the bottom two terminals of the meter. These will be directly below the two hot line connections. Strip the wires and insert them into the terminal. Tighten the screws until they are tight and tug on the wires to be sure that the connection is tight. To effectively protect a ground wire running from the electric meter to the ground rod, you need to add a piece of conduit. Install a connector and a piece of pipe from the meter to the ground to protect the electric meter ground wire. Many wires have been damaged by lawnmowers and weed trimmers without protection. Install a ground wire and connect the wire to the neutral ground terminal in the center of the meter, next to the neutral connect. In residential installations, the neutral and ground are a common connection called a neutral/ground connection. The other end of the ground wire attaches to a ground rod and is attached to a ground lug. Before you can connect the electric meter neutral wire, you must first know how the wire is marked and why. The wire marked with the white tape is the neutral wire and it is attached to the neutral lug terminal. The terminal is located directly in the center of the meter between the two hot wires. Strip the wire and insert it into the lug. Tighten the lug screw with a screwdriver and tighten snugly. Tug on the wire to be sure that it is tight. Be sure to mark this wire with white tape.